State Relations coordinates the activities of the university on matters relating to legislative consideration of the state budget and policy issues. 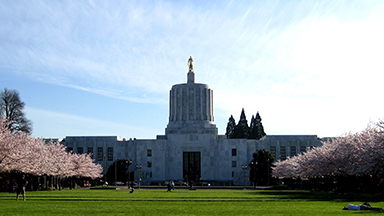 Staff members serve as the liaison to the Higher Education Coordinating Commission, other executive branch agencies, and the Oregon Legislature, monitoring legislative and policy initiatives. They also manage the university's advocacy program and staff legislative committees of the UO Foundation Board of Trustees and UO Alumni Association Board of Directors. Libby Batlan is associate vice president for state and community affairs. Hans Bernard is assistant vice president for state affairs and special assistant to the President - Portland.